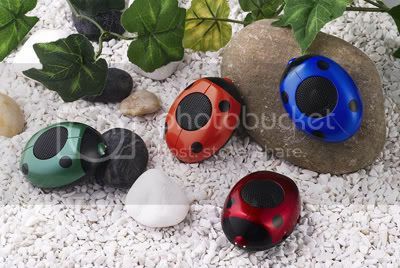 Ladybird speakers are certainly not as small as a Ladybird but no doubt they are really cute just like a Ladybird. I just couldn’t resist from posting over here. They are really small measuring just 72*54*34mm in size. You can carry them anywhere easily in your pockets. They can be easily plugged into an iPod, MP3, MP4, MD, CD, Notebook, PC, PDA, PSP or for that matter any other device with a 3.5mm audio frequency output. They are available in 4 colors- Red, black, blue and green. Now words on pricing though, but you can check out the company product page for more details.